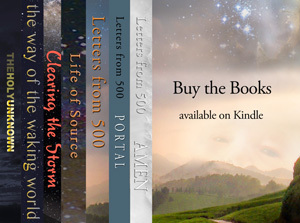 The seventh and final book, in the Letters from 500 story, is about to be published. In 2009 the story began, and the thread of life’s harmonious potential grew and grew. In many ways, the idea of a perfect world, where we experience our oneness and our planet’s magnanimous embrace of our survival, can be a reality. Thank you to all who have joined our merry band of believers. On June 5th Robert will be offering a presentation of Letters from 500 at the AHA Center [Association for Higher Awareness] in Morristown, NJ. We are inviting all of you who are available to attend this evening’s presentation. The admission fee is $10.00.